We had a situation that our car was in the garage and the door wouldn't open. I called and within a few hours our door was fixed. Houston is a definite asset to your company. He is very efficient and explains exactly what he was doing. Great guy and a great company. I will definitely recommend your company. What a great company... from the wonderful young lady who answered my call at Superior to our technician, Houston who made the house call. Houston was very knowledgeable and very kind when answering my questions. Took time to educate me on my garage door. I have already spread the word to my neighbor and she will pass it on as well! Great job! Feel like I have made a friend I can trust!! I needed servicing on the wiring of my existing doors. Houston was able to come the same day, was polite, professional, personable, and competent. He explained what and why he was doing. I was very pleased and will call this company again. I would like to first say that this business should have forums on how things should be done these days!!! Received call from representative from Superior Doors and within the hour,I received the call from the Technician Houston.. I was more impressed that we didnâ€™t even have to be at home when door was installed. Effective and efficient is the best way to describe this company!!! Thank you for keeping great service alive in a crazy fast pace we donâ€™t care about the customer only getting paid atmosphere...!!!! WILL recommend this company to ANYONE that needs a door done!! Haven't had the work done yet, but wanted to say that the young lady who took my call was very pleasant & patient. If the service call scheduled for tomorrow is anything close, I should be a very "happy camper" - I'll post again then. Houston arrived on time, identified the problem and quickly fixed it. He then tested the door and adjusted it to make sure it operated smoothly. When he finished, the door operated more quietly than when it was brand new. Houston was courteous, polite, efficient, and did not make a mess. He is a professional and an asset to your company. It was my pleasure to make his acquaintance. My husband and I had a new opener and garage door installed last week. We are extremely satisfied with their install work, customer service and willingness to help us rather quickly!!! Houston of Superior Overhead Door just installed the LiftMaster belt drive model with WIFI. It works great! He also helped program our car. He adjusted spring tension, lubricated, balanced the door. He took the time to explain the many great features. He also disposed of the 40 year old broken opener. Houston is the best! After he left we hooked it up to our home WIFI. NOW WE CAN MONITOR AND CONTROL OUR DOOR WITH OUR PHONES FROM ANYWHERE IN THE WORLD! How cool is that? Houston, our technician, provided expedient service to resolve our garage door issues before the winter cold. He was kind, courteous, explained his actions in detail, and gave a reasonable quote for the service. 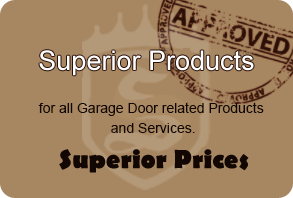 I will be recommending Superior Overhead Doors based on Houston Ball's professionalism. Called another company out and felt like I was trying to buy a new car. They wanted to replace all the rollers, springs, and cable rollers at a cost of over $1500.00. When I balked at the high price, the tech called his manager and the manager tried to pressure me into the deal. Then he began reducing the price. I hung up the phone and asked the technician to leave. Called Superior and best thing I ever did. Honest, on time, quality repair. Technician, Houston, looked everything over, indicated that I only needed springs, installed springs, inspected rest of assembly, and adjusted the opener. All of this for just over $215.00. Absolutely great company and will definitely be my first and only call for any future garage door repair or replacement. Houston removed all the remnants of our 50 year old garage door and installed all new everything. He was very professional, very personable, and hard worker. He did the whole job by himself. Houston represents your company well. We are very pleased! Oh, Harold did a good job measuring and explaining our options. We were so pleased by the entire interaction with the company from our 1st visit with Steve to the beautiful installation done by the installers. We strongly recommend this company. Excellent service. Very satisfied with my new garage door opener. They even came & installed it earlier than scheduled! I couldn't be happier! Very satisfied with the entire process from ordering to installation. Starting with the lady who first took our information who was very pleasant and thorough. Harold who came and measured and took the order arrived on time which is very important to us. He was courteous and professional. Then Scott who installed the door also arrived on time, again this means a lot to us. He also was very courteous, professional and worked continuously until the job was done. There was a manufacturer problem with a couple of the screws and this caused a delay, but Scott stayed with it and took care of the problem. He done a great job. We are completely satisfied with the job done. That is why I called you on the phone earlier today, I just wanted to let you know what a great job everyone has done. Thank you. Excellent service installing garage door opener! Superior is a perfect description of the level of customer service that I received! Houston arrived during the time frame you promised and was professional, polite and left a clean job site! I would highly recommend your company in the future! I'm so pleased with my new door. Houston did a great job with the installation. A very nice young man. I also enjoyed doing business with Harold, who sold me the door. I will recommend your company in the future. John was here to do a minor repair job. Very courteous and thoroughly explained explained everything he did. Houston adjusted and lubricated 6 garage doors. He was very courteous and did a great job. Houston discovered a problem that could have become a big problem if not fixed. Steve @ Tammy, we thank you so much for your grace to us during a time of need. It was very timely and your employee John was quick and helpful. We will tell others of your exceptional customer service and pray God blesses your business. Great experience from start to finish! Harold arrived at the specified time, provided a quote on the spot, and answered all of my questions. On the day the installation was scheduled, Houston arrived on-time and did an excellent job of installing the new door and opener. It looks and works great! I highly recommend Superior for anyone wanting quality products and prompt, professional service at a very fair price. Excellence, professional, prompt! We are very happy with the garage door and the service was above standard. Thank you Superior Overhead Door! Excellent job! Very quiet door and no messes left behind. The crew called prior to their arrival, showed up promptly, removed and stored the existing door and had the new door and operator installed in about 2 1/2 hours. Very clean, organized and professional team. I purchased a 360 Aluminum and glass door that makes a world of difference in the appearance of the home. At least a dozen neighbors have told me how much they like it and on two occasions, passersby stop and comment. The company and product, both winners! I highly recommend Superior Overhead Door Company. My wife and I are very pleased with the professional work done, to replace our 30 year old garage door. The new door looks fantastic. The installers were great. They worked fast and knew what they were doing. They tested and made sure everything was working perfectly and cleaned up the area before they left. Now I know why their company name is Superior Overhead Door. our garage door was installed several years ago. we were very pleased then. Late Friday afternoon the spring broke. my car was in the garage. i called and they sent John out. He was very efficient. He showed me what happened, told me my cost, and got the job done. Had me back in business in no time. to me serving the original product is what a good company is all about. I really like the new garage door installed at our home today, excellent quality. Houston the installer did a fantastic job and was extremely thorough and his attention to detail was rare these days, he wasn't leaving until the door fit and operated perfectly! I will highly recommend Superior to friends and family. Thanks!! Installed two garage doors in our new construction home. One was 18x8 other 10x8. John who is their service man is the reason I use them on this project. He had done repair work at my current home and was AWESOME! When I talked to Steve the owner I purchased the garage doors with the understanding John would do the work. Add bonus, their pricing was very competitive! I don't plan on using anybody else going forward for any garage work I may need! LOVE, love, love the new doors! Great job! Ben & Mark were great installers. They were courteous, professional, very impressed! Houston did a great job on installation and was very helpful answering questions! Hey Steve, thanks for the prompt response. John is the guy that fixed the spring on the old door, prior to me ordering the new door and he has a wealth of experience. I'm enjoying the much more quiet operation of the new door. I saw the article in the Value News and was in agreement with what you mentioned in the article. Thanks again! Give Houston a pat on the back. Very nice young man, did and excellent job! We appreciate you attention to detail with the install. I really appreciate you placing your top guy on this job! He did a great job! Tech, Houston was very through, polite, and mannerly. Wish to express our thanks to you for your service. Your professional attitude was excellent, your price of service was quite reasonable, and the young man who did the work was extremely personable as well as very, very, competant. I do want you to know I would (and will) recommend your firm highly.